Please refer to our stock # 10801 when inquiring. 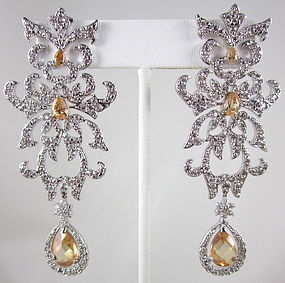 These magnificent chandelier earrings are hand made in India and look like the "real thing". They are made from low content silver with a rhodium plated finish and are intricately hand set with pave CZ crystals. They are 3 1/4" long x 1 1/4" wide and have pierced tops. They are in excellent condition.